A classic breakfast casserole the whole family will enjoy. 1. In a large sauté pan, add the oil and sauté the onions and garlic over medium heat until translucent, about 5 minutes. Add the sausage, peppers and half of the basil; stir to combine. 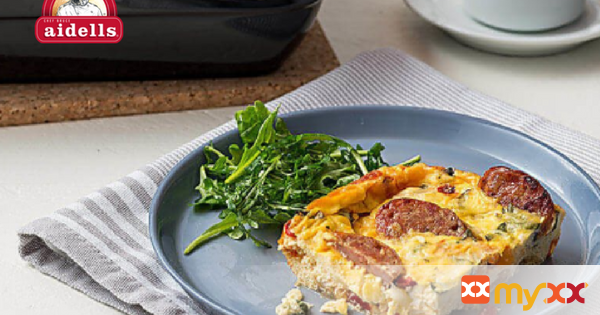 Spread sausage mixture into a buttered 13x9x2-inch glass or ceramic baking dish. 2. In a large bowl, whisk together the eggs, half-and-half, and half of the cheese. Season with pepper. Pour over the sausage mixture in dish and sprinkle the remaining cheese and basil over the top. Bake until golden brown and knife inserted into center comes out clean, about 30-40 minutes. Let stand 10 minutes before serving.